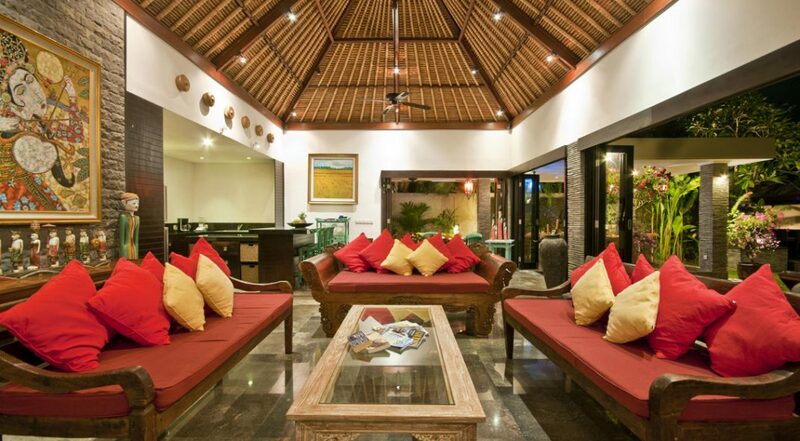 From $ 540 $ 1,030AUD per night We have direct contracts with most villa owners. We don't add any booking fees. We are 100% transparent with no nasty surprises. 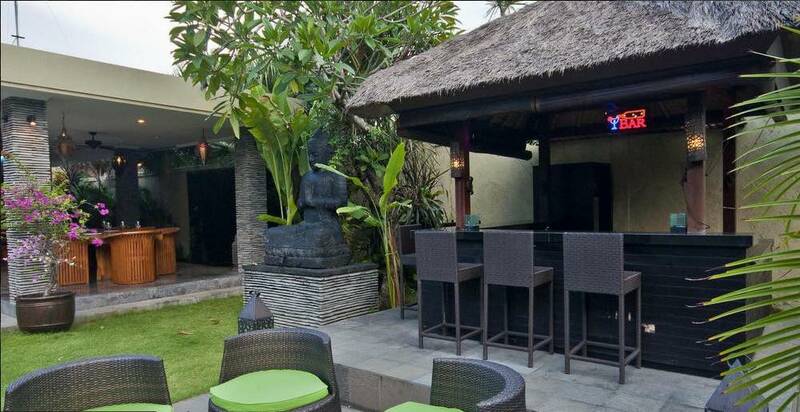 Luxurious holiday villa in a central and very popular Legian location – you are close to ‘Eat St’, and all those incredible restaurants, day spas, yoga studios, clubs, kids attractions & shops. 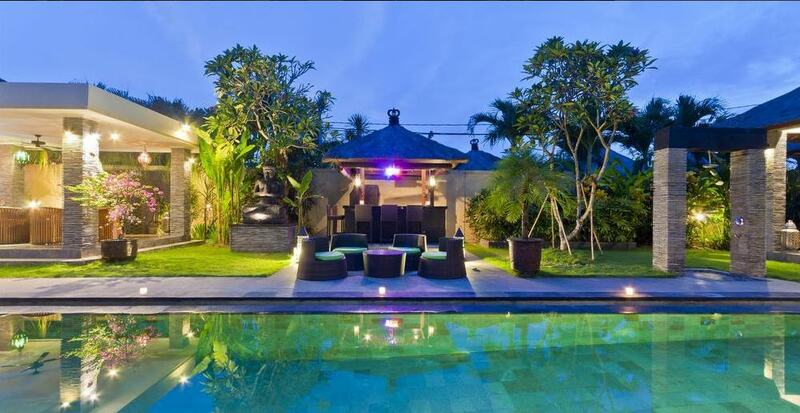 Tucked down a small lane just behind Bintang Supermarket, on Jalan Raya Seminyak, lies the brilliant Villa Mahkota. 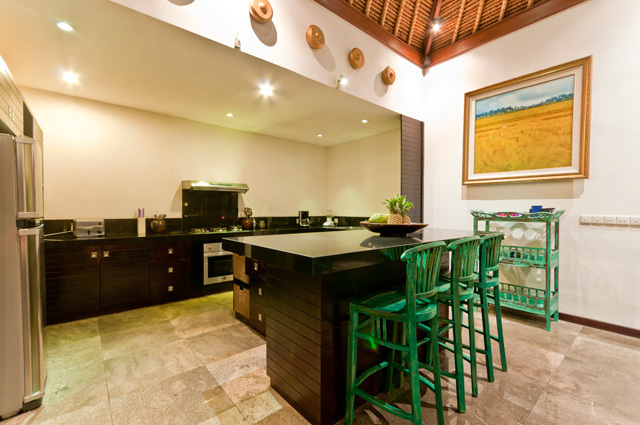 This elegant 4 bedroom Legian villa offer luxurious accommodation amid a traditional Balinese pavilion style, resort layout. An extensive outdoor garden with a large private pool sits next to the outdoor poolside bar, a recipe for lots of fun in the sun. 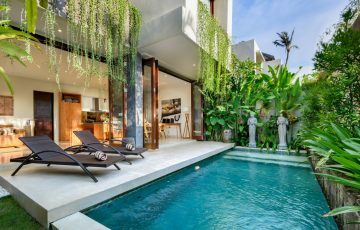 This is the perfect retreat for family and friends wanting a special Bali getaway, you could be excused for never wanting to leave the villa your entire trip. 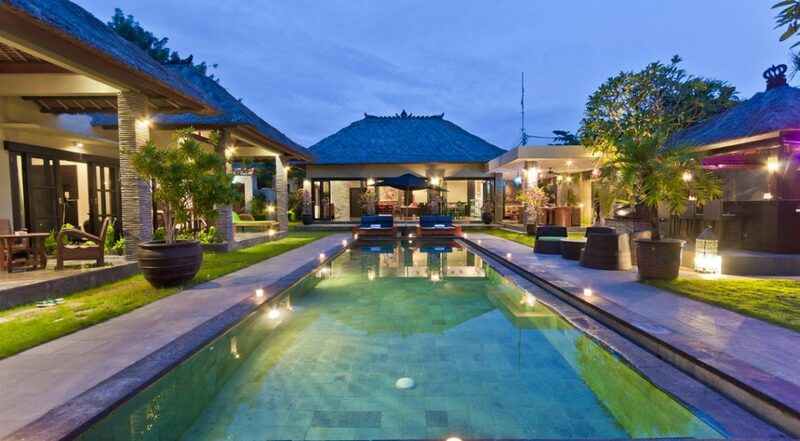 The expansive tropical pool runs straight down the center of the garden with traditional thatched roofed pavilions either side. Two twin daybeds, which recline, have chunky cushions and padded head rests with a parasol for shade in the middle of the day. 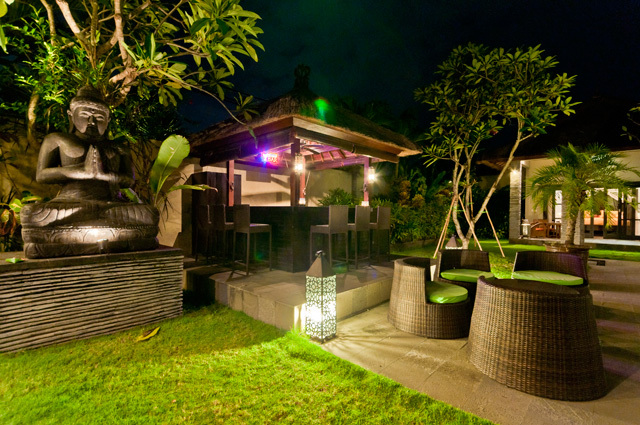 A rattan table set is prepared in front of the outdoor bar with stools as well for guests to pass time as they enjoy cold drinks. 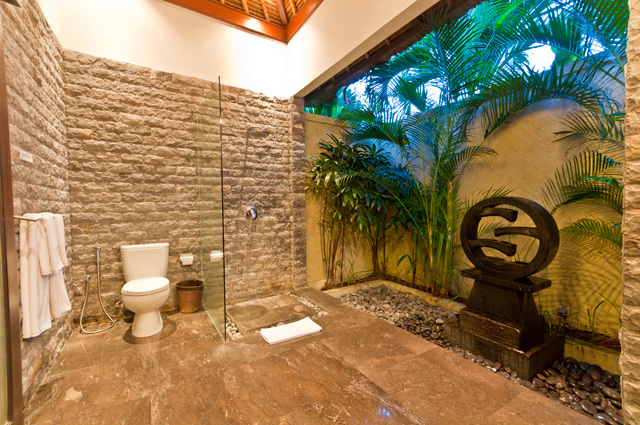 Koi ponds, vibrant frangipani trees and lush green grass complete the tropical a fantastic tropical setting. There is also a BBQ where the guests or talented chef can cook imported meats or maybe some local seafood from the markets. The air-conditioned living pavilion features soaring ceilings can become an el-fresco setting by simply sliding back the large glass doors. 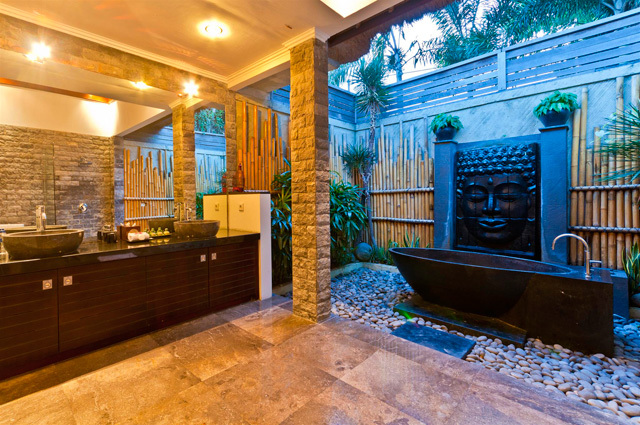 The natural stone flooring is a highlight and the walls and sideboards are decorated with beautiful art and ornaments. 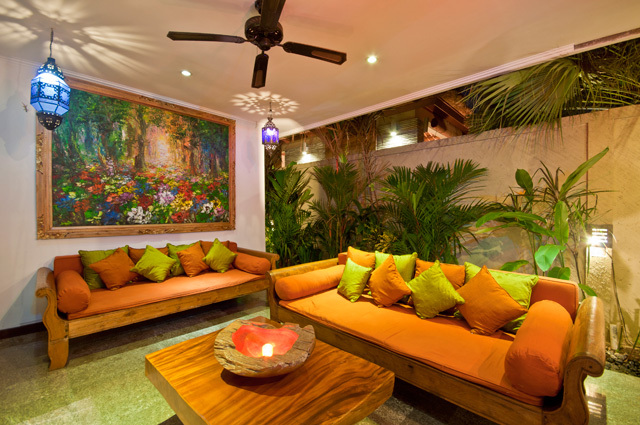 Large antique chairs almost day bed in size offer a comfortable spot for guests to relax and converse. The kitchen is stacked with modern appliances and a breakfast bar features matching timber stools, table setting and side board all in a soft pastel aqua. 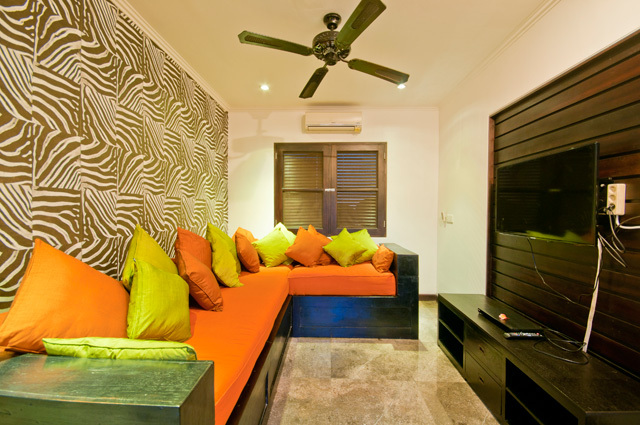 Another air-conditioned TV room has large built in sofas with colorful orange cushions great for family and friends to watch a newly purchased DVD on your travels around Seminyak that day. 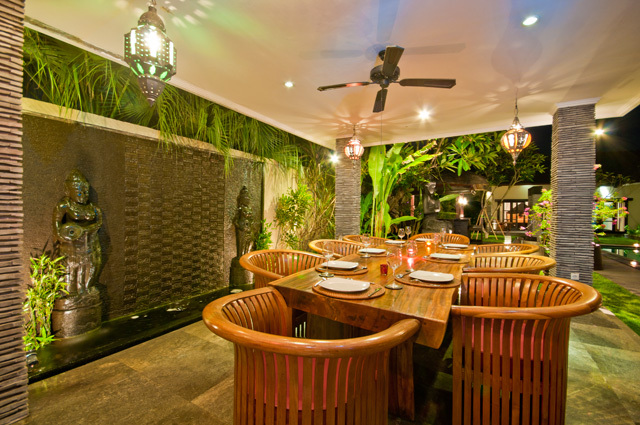 A more formal dining area features an open-air space with a calming water feature, ceiling fans and a natural solid timber table. 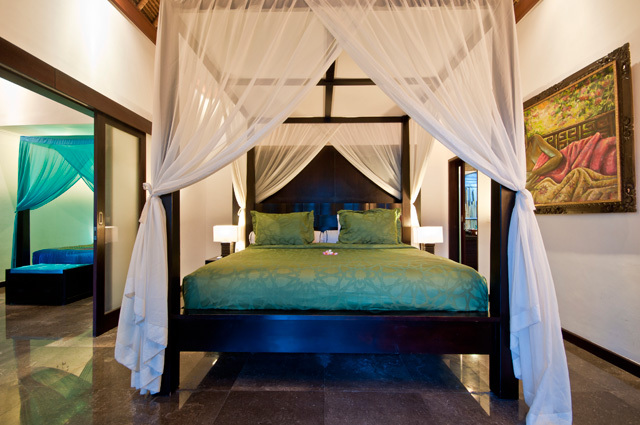 Guests of the master suite are spoilt with a private verandah housing a wonderful daybed and table setting. 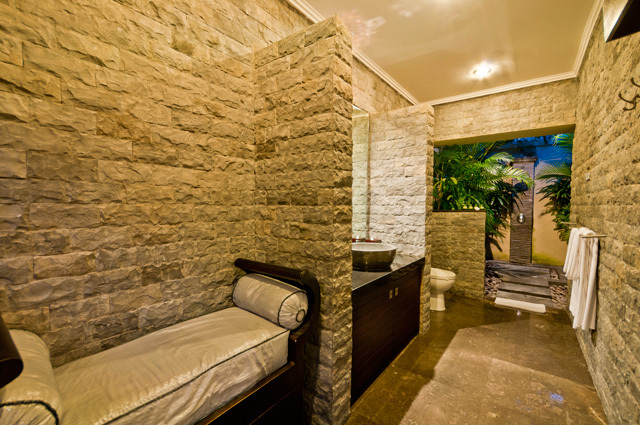 The king size bed is draped with sheer netting and the beautiful stone floors continue through the bedrooms with ample wardrobe space and an en-suite bathroom that is to die for with a huge soaking bathtub in the open-air with a beautiful Buddha wall feature and natural stones. 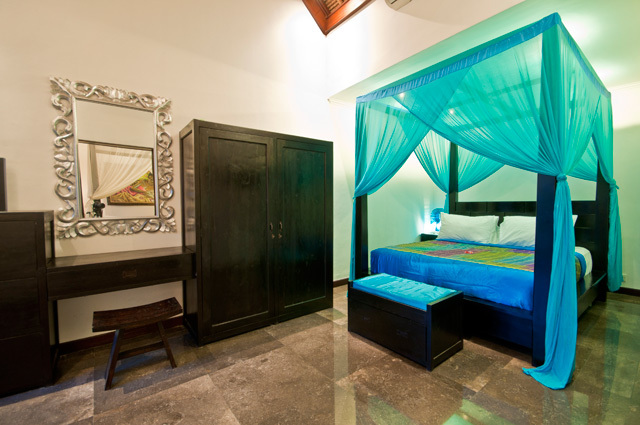 The guest bedrooms are air-conditioned with spacious king-size beds, semi outdoor en-suite bathrooms that feature monsoon showers with tropical plants and water features. 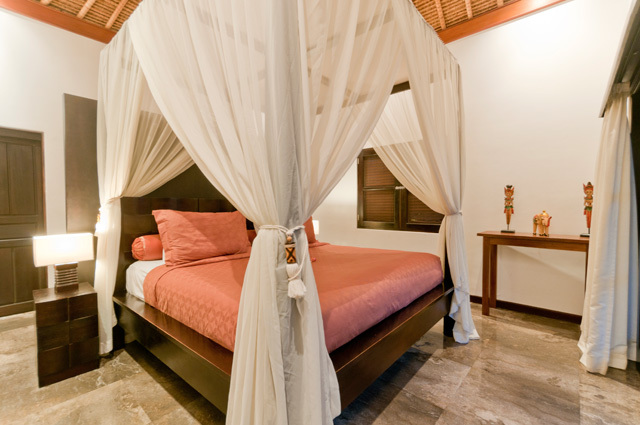 The room with a queen size bed for kids that connects to the master suite, shares the master suite’s en-suite bathroom. 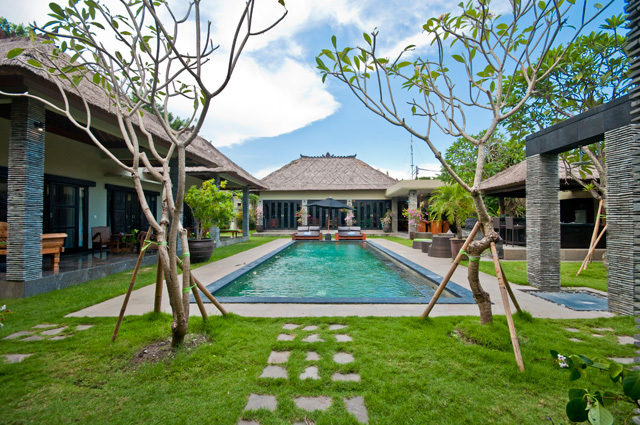 The guests of Villa Mahkota will be more overjoyed with the warm and welcoming staff and wonderful service they receive throughout their stay. 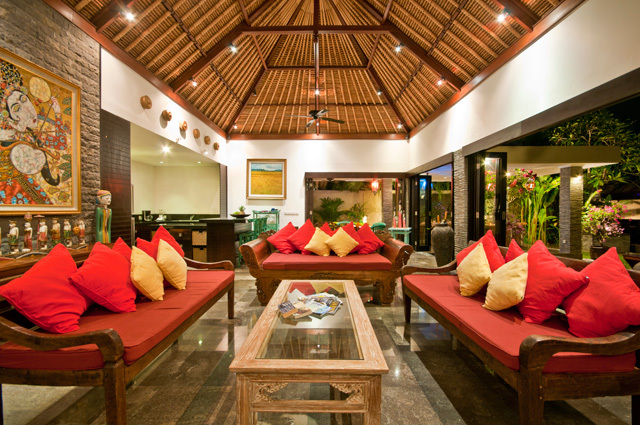 A team of well equipped butlers, housekeepers, security and a senior villa manager will make sure you have an amazing holiday in Bali. 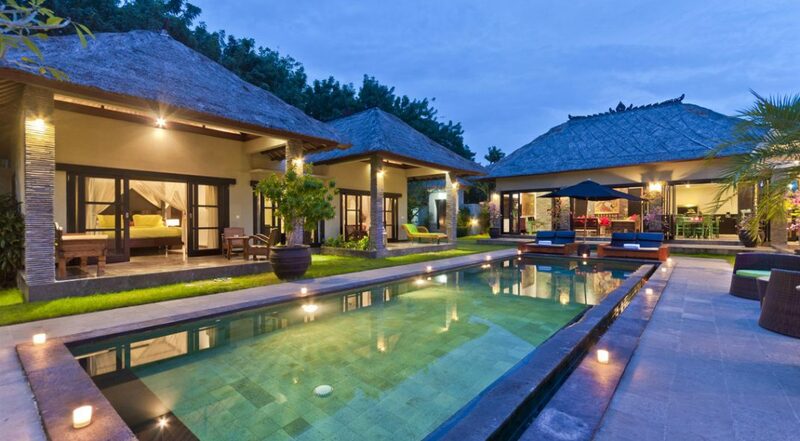 Villa Mahkota is strategically placed for guests to take full advantage of everything Seminyak has to offer. 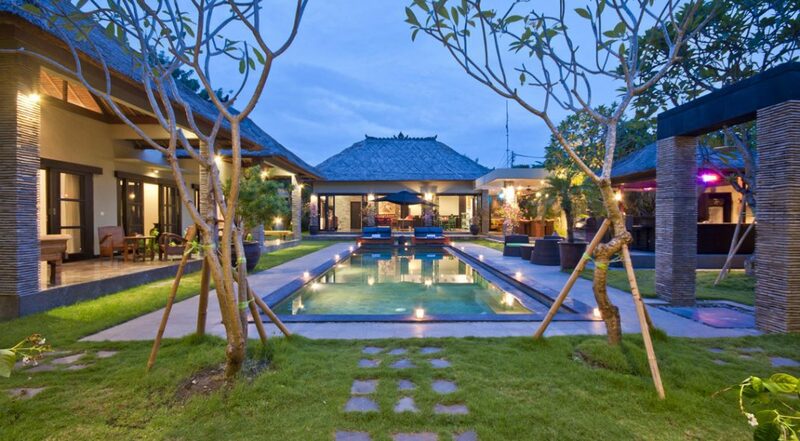 The villa gives direct access to Jalan Raya Seminyak where guests can head north a short distance to Jalan Oberoi, the famed ‘Eat Street’. Or go a little north and you will reach the sands of Double Six Beach and the happening Cocoon Beach Club and all those fabulous restaurants along the beach. Mahkota is really in the thick of all the action so if your into your food and you love shopping or grabbing a bargain this is a great villa for you. If your here with the kids then there’s also lots of things near you to keep them entertained; Finns Recreation Club, Waterbom Park or the Kuta Boardwalk where there is a cinema. 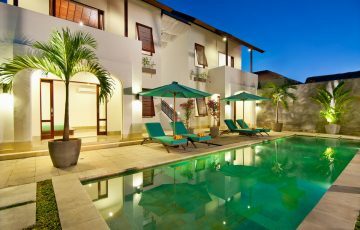 To view other 4 bedroom Legian villas or our full range of Bali villas near Double Six beach please browse this website or contact our reservation team. 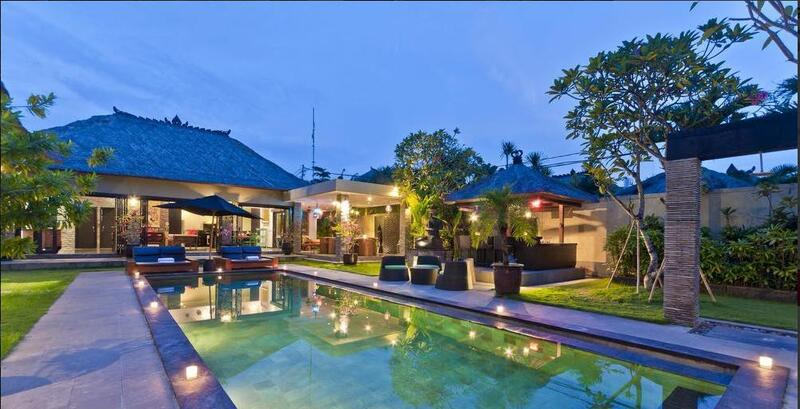 This is one of Legian most popular villas so please book Villa Mahkota well in advance if your planning a trip to Bali especially during Australian school or public holidays. Complimentary grocery shopping assistance – your villa staff will take you to the best places around Seminyak to stock up on all your goodies, groceries, snacks and alcohol. 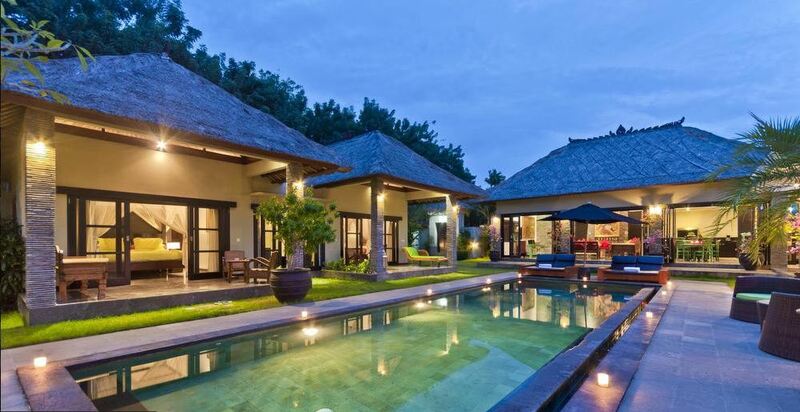 Villa rates are includes Goverment tax, service charge, taxes, etc. Welcome drink and cool towel upon arrival and one complimentary baby cot if needed. 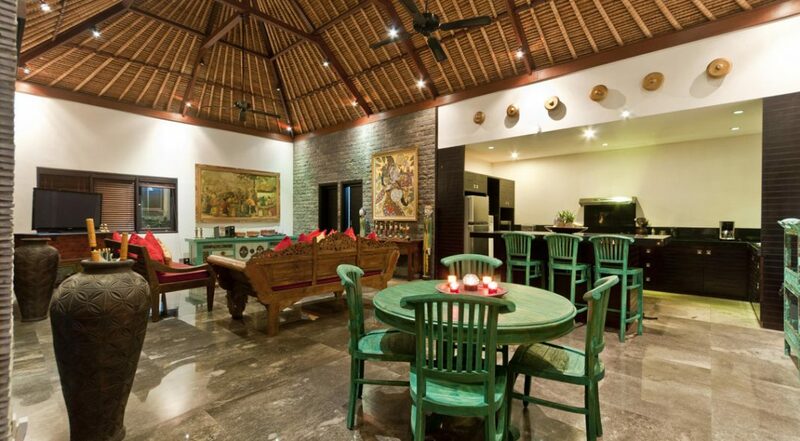 Spent a week here with another family and loved Villa Mahkota from the moment we stepped inside. The facilities were seriously world class and the pool and garden areas were better than we expected. There were 8 of us in total and we found that there was enough room and space for everyone. The kids mostly hung out in the pool area while we were happy to simply relax, unwind and soak up the gorgeous surroundings and villa ambiance. Most afternoons we went to the beach for the sunset and a few cold Bintangs. We cannot rave on about this enough and we are already planning another trip next year with another family. Without a doubt one of the BEST holiday experiences we have ever had as a family. 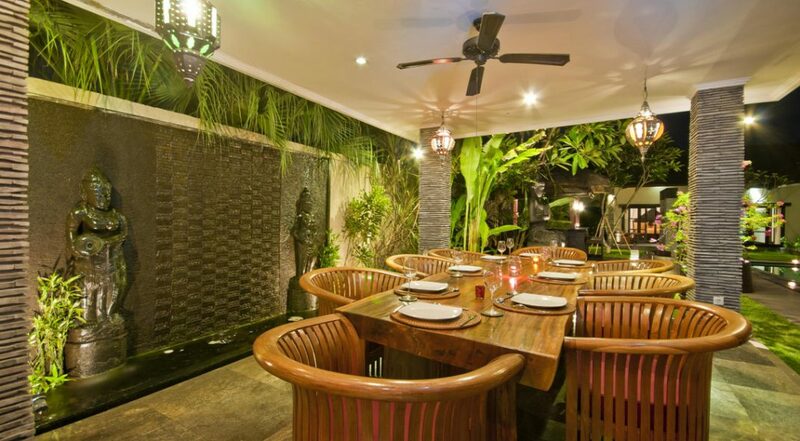 We love the fact that we were close to the main shopping areas in Seminyak as well as the nearby restaurants where we could go at night with the children. 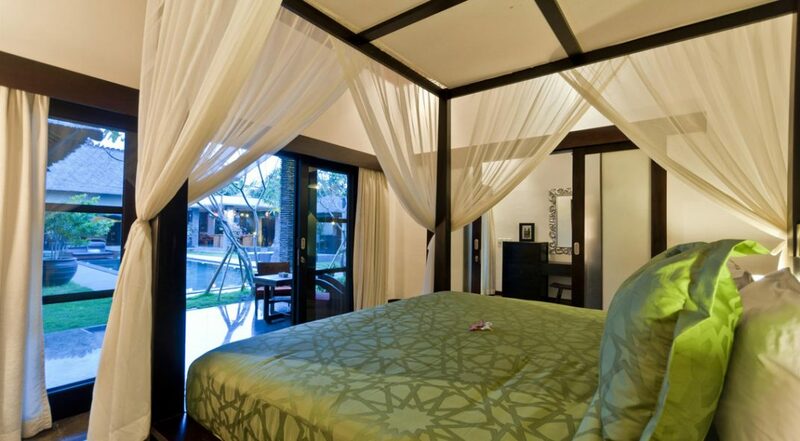 Comfy bedrooms and spacious interiors. 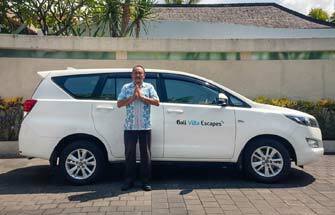 A huge thanks to Dewi and Ina at Bali Villa Escapes for organising this at the last moment for us. You guys are legends! Stunning, amazing, can't wait to come back! 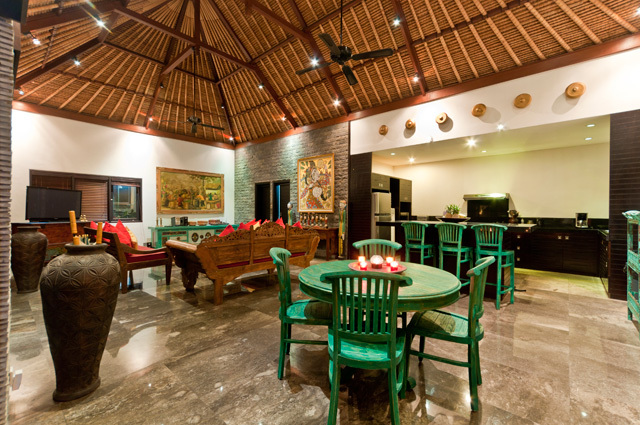 We had a fantastic time while staying at this amazing and gorgeous villa. We have already recommended it to all our friends back home in Sydney. 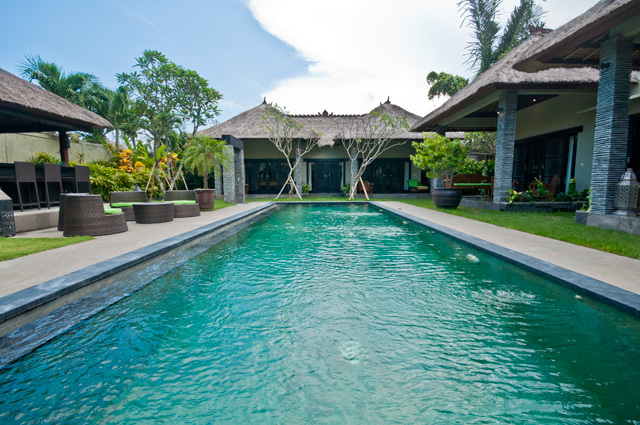 Loved the villa especially the pool area as well as the attention given to us by the villa manger Komang; who could not do enough for us! Missing the place already. 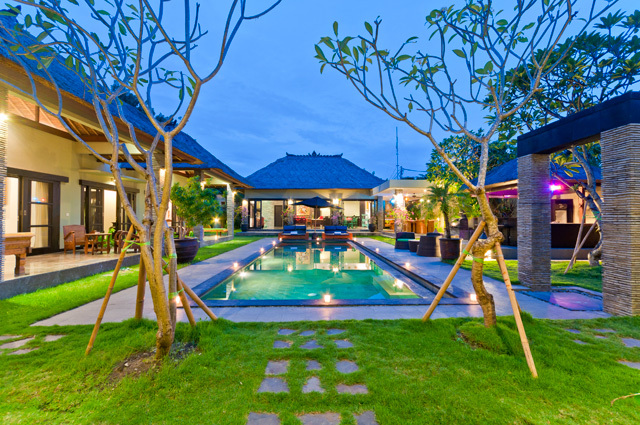 As expected this villa was divine and just what we were looking for on our family holiday. Pool and interiors were perfect - location was also unbelievably good! Stayed there at the end of June for a week and loved the location and the swimming pool. The staff were also really lovely. Being near Bintang supermarket ( where we could buy all our food & snacks) and all those restaurants at Double Six beach was so handy as we brought the kids. Just want to thank all the staff at Villa Mahkota for the best family holiday ever! Dreaming of coming back again.